Rubbermaid Custom Closet Organizer Only $86.24 Plus FREE Shipping! You are here: Home / Great Deals / Amazon Deals / Rubbermaid Custom Closet Organizer Only $86.24 Plus FREE Shipping! If you want to upgrade that plain closet from just a rod to something fabulous, head to Amazon for this fantastic deal! Get the Rubbermaid 4 X 8′ Custom Closet Organizer for Only $86.24 (orig. $219.99!) Plus FREE Shipping! This is the lowest price Amazon has carried this! Make the most of your closet space with this adjustable and customizable 4-8 foot custom closet kit. No cutting needed–includes all necessary hardware to assemble. Satin-nickel and chrome finish won’t snag or rust. For walk-in or reach-in closets. 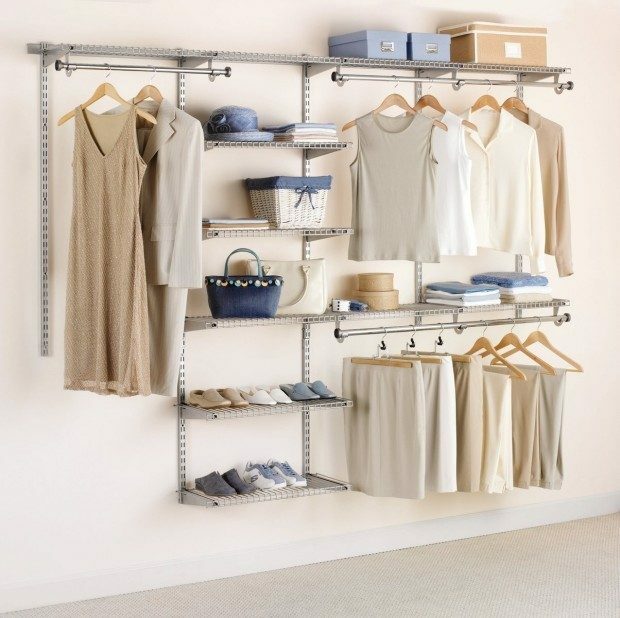 For larger closets simply pick up extra configurations kits which work seamlessly together. Telescoping rods and expanding shelves provide 20 feet of shelving space and 12 feet of hanging space. 7 26-inch shelves; 2 48-inch shelves; 2 48-inch top rails; 19 brackets; 5 47.5-inch uprights; 2 25-inch upright extensions; 2 hang rods.